Our Solunar Tables are already adjusted to Eastern Daylight Savings Time (for days requiring that adjustment) for ease of use in Pennsylvania. Solunar periods begin at the approximate time shown, and last about an hour for minor periods and 2 hours for major periods. Click on image to see full size meridian map. For every degree west from the 75 degree longitude line, add 4 minutes to the times on the calendar for the most accurate solunar timing. It is no secret that the moon, sun and other celestrial events regularly influence the activity of fish and game in a great way. The most obvious proof of this is the great importance of tide tables in salt water fishing. Tides are created by the position of the moon and sun, the two greatest factors in calculating these tables. 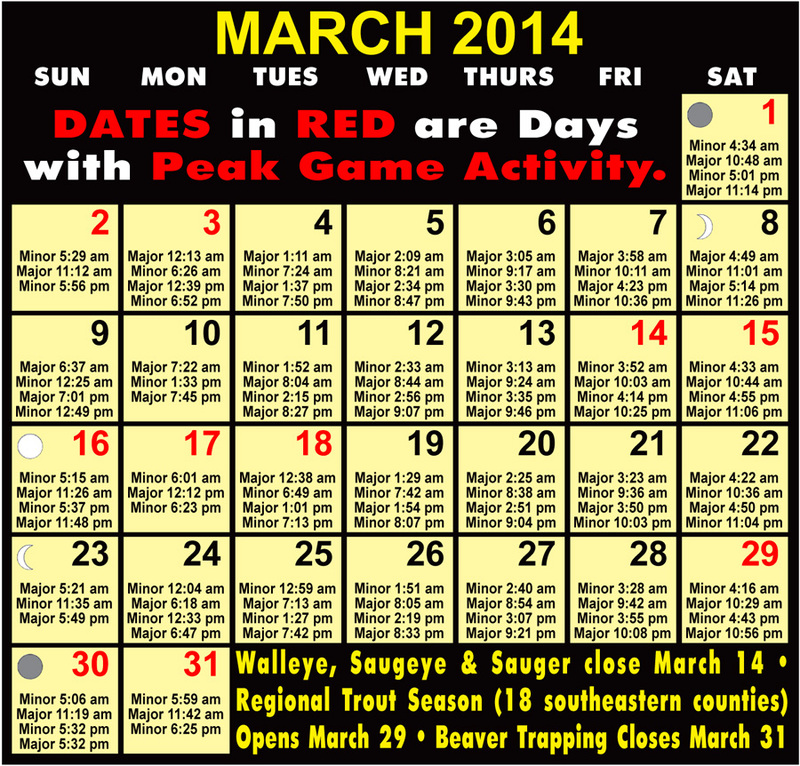 The time-tested Solunar Tables take all the available data and distill it into an easy-to-follow timetable of the peak hunting and fishing activities. 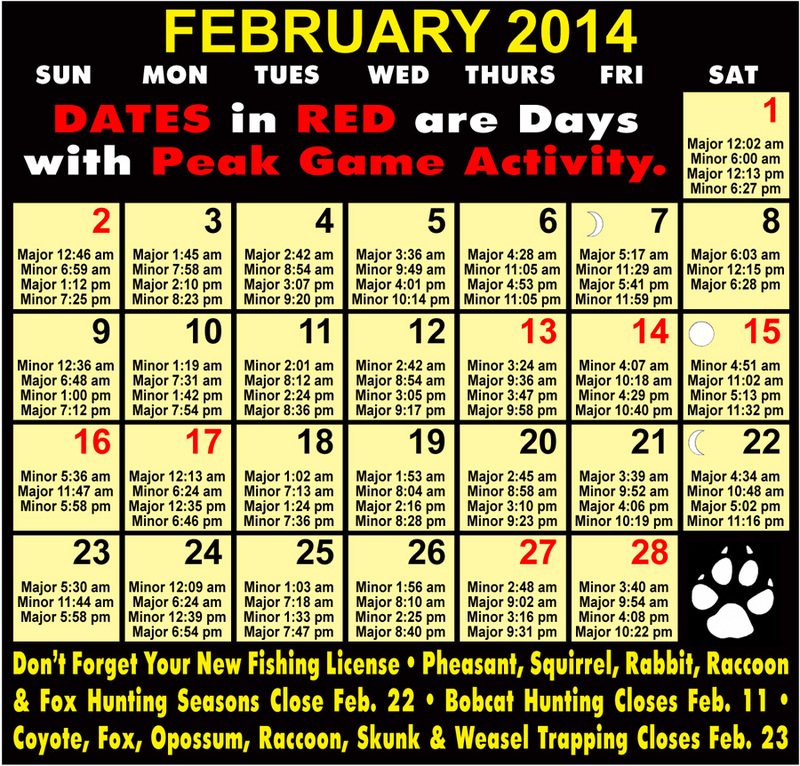 Many professional as well as amateur anglers and hunters will not go out until this table shows that it is time. When following the table, keep in mind unusual local events which may also influence peak feeding and activity periods. These would be increased discharges below dams, unusually heavy rains and the coming in of exceptionally depressed, low pressure weather cells. Incorporate these into the minor and major feeding periods for that particular day. Reinforcement of more than one key influence can make for a trip of a lifetime!